George Brown College has announced that Moriyama & Teshima Architects + Acton Ostry Architects have been selected to design The Arbour. 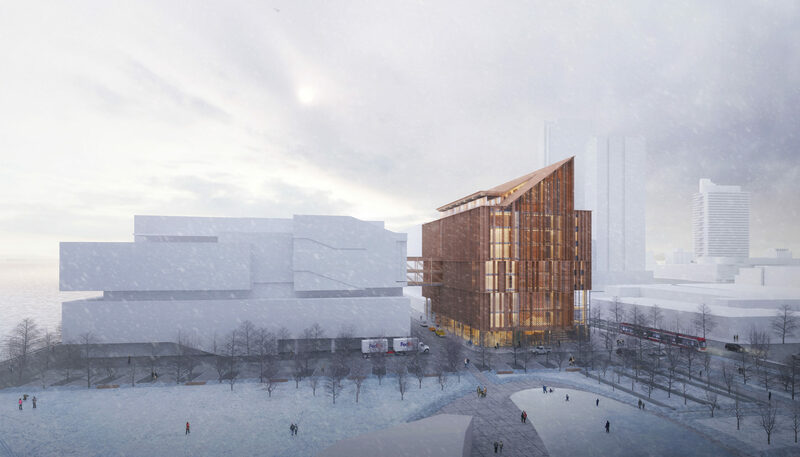 This $130-million project will be a 12-storey mass timber building on George Brown’s Waterfront Campus, ushering in the first building of its kind in Ontario. The team was one of four shortlisted teams in this international design competition. A unique evolution (and innovation) in tall wood structure design, (a ‘kit of parts’, consisting of CLT floor panels and ‘wallums’), provides a “…memorable symphony of the use of wood throughout this remarkable design”, providing a rich and engaging character to the building’s interior spaces. The design is organized around a wonderful sequence of welcoming interior public spaces beginning with a multi-storey arrival space along Queens Quay providing a powerful invitation up into the heart of the building. This primary movement sequence through the facility is complemented by a series of double height ‘breathing rooms’ positioned at the east and west ends of alternating floor levels, with strong visual connections to Sherbourne Common and the emerging neighbourhood, providing the kind of much desired student amenity and informal work space identified by GBC in their design brief. This design was identified as having the best approaches to overall energy use and resiliency/future proofing, with particularly high achievement in sequestered carbon through the extensive use of an innovative ‘all-wood structure’ approach throughout. The design presents an engaging and welcoming façade to its primary address along Queens Quay, complemented by its unique building profile to Sherbourne Common; together these combine to provide a striking landmark for this highly visible site condition. The multi-storey welcoming space at the intersection of Queens Quay and Sherbourne Common strongly connects students and visitors with the primary N/S bridge connection to the existing Daphne Cockwell Centre to the south and presents an engaging and inevitably lively corner to those arriving at Queens Quay and Sherbourne Common. 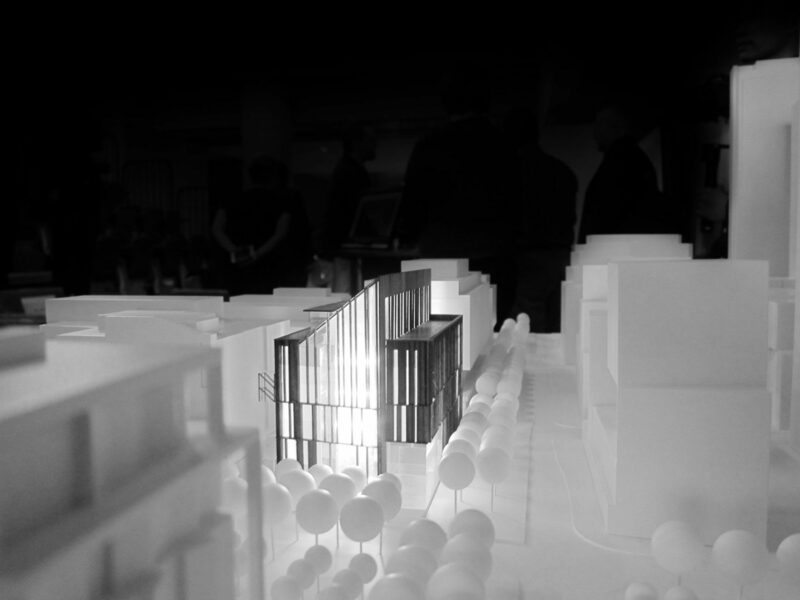 The proposal presented the most accommodating and sophisticated overall organizational strategy and typical floor plan of all the submissions, providing a highly adaptable arrangement, most amenable to supporting the range of classroom, lab and other academic spaces imagined. The design provides exquisite space planning, well considered functional relationships, and spaces with variety and quality that will have strong resonance with students and the general public. The suggested capital cost of this proposal was assessed to be generally within the identified project construction budget, based on the information provided by the team and reviewed by the GBC Technical Review Team Cost Consultant. This combined with a high ranking on perceived resiliency and future proofing, provided this team with a very positive ranking on this aspect of consideration. The Moriyama & Teshima Architects + Acton Ostry Architects team is thrilled and honoured to have our design for the Arbour selected for this transformative project. We are ready to embark on this exciting journey with George Brown, Waterfront Toronto and the City of Toronto. We look forward to ushering in a new era in Canada’s design and building industry for our collective low-carbon future.